Leading experts will present the current best practice in roadway lighting to protect human health, public safety, ecosystems, and quality of life. 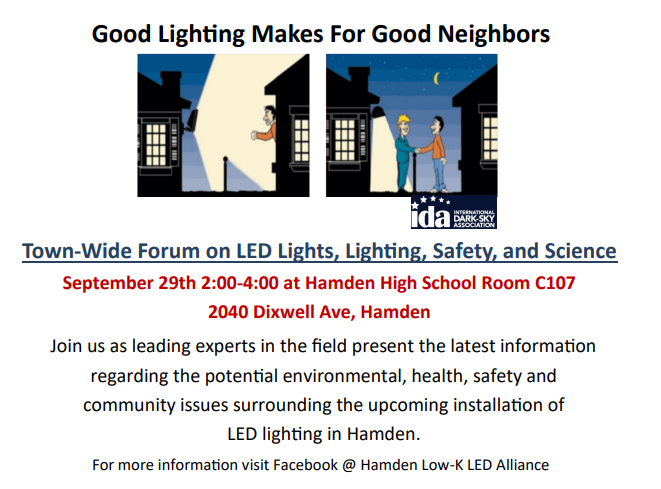 The forum will raise awareness about the difference between LED lighting and older, High Pressure Sodium and incandescent light sources, and will address the issues surrounding the upcoming installation of LED streetlights in the town of Hamden. The panel will include of Professor of Community Medicine and Health Care: Dr. Richard Stevens of UConn, Catherine Diviney; Town of West Hartford Energy Specialist, Leo Smith; member Roadway Lighting Committee (Illuminating Engineering Society), Christina Crowder; International Dark-Sky Association, and on hand to answer specific question regarding regulations and safety; Daniel Kops, Hamden Town Planner and Hamden Police Chief, Thomas Wydra. Speakers will present the latest information regarding the potential environmental, health, safety and community issues surrounding the upcoming installation of LED street lighting in Hamden and to outdoor lighting in general. In addition, the forum will have guideposts to systems, solutions and goals, that residents of the Town of Hamden should work to achieve. Panelist will speak to their specialty, have a panel discussion and open the floor to questions. Sponsored by Hamden Low-K LED Alliance (https://www.facebook.com/groups/CTLowKLED/ ), State Representative Michael D’Agostino, 91st District, Office of Mayor Curt Leng and the Connecticut Chapter of the International Dark-Sky Association.